Land Rover has pounded out rough-terrain handling trucks for years. Think of safaris and you think of Land Rovers, usually with a tire mounted on the hood and a rhino charging after it. Today’s Land Rovers and Range Rovers are just as capable in the bush, but civilized enough to lug the queen around her estate, if need be. The tested Aintree (a town in England) Green Range Rover Supercharged LWB (long-wheelbase) is exceedingly long on the luxury, while still designed to dominate any terrain you throw at it, mud, slush, rocks and streams. You might be surprised to find out that the tested Rover’s starting price is $105,300, plus an $895 delivery fee, which compared to the base price seems a bargain. Amazingly at six digits the Rover did not come with any running boards or power step-up and nary a third-row seat. Yet there were options that pushed this luxury land yacht to $122,900. What’s an option once you hit $106 grand or so? Many apparently. The lovely test ute added a vision assist pack that included a surround-view camera that allows you to view the truck’s perimeter. Cool! It also included automatic high-beam headlights and adaptive Xenon lights, plus a blind spot monitor with a closing vehicle sensing & reverse traffic detection system. That alerts you if you’re about to ram a stopped or suddenly slowed vehicle and also see out the back. Many luxury cars and trucks now have similar systems. The package also featured configurable mood lighting (Shagadelic baby!) and a leather steering wheel (again, something most $30 grand vehicles have, or offer). Price tag? A modest $1,760. For instance, a $4,150 package delivers a 4-zone climate control system that includes solar attenuating windshield glass, which is a tightly woven grid pattern to help disperse oncoming lights. Look closely and you can see it in daylight. 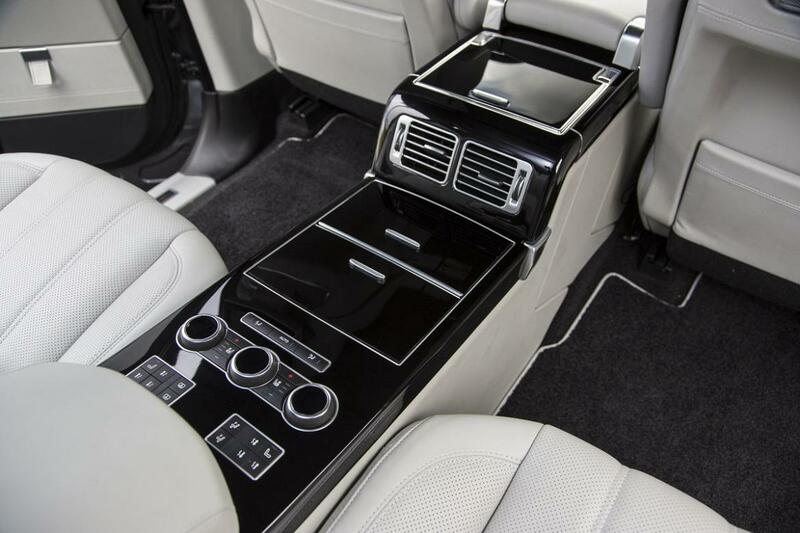 More important for us luxury buyers who expect a little bling at these prices is a front seat massage system. Just press a button on the dash and you can choose heated or cooled seats, AND a message, although there’s but one setting. Actually the system worked flawlessly and was comfortable. Some of these systems I’ve tried are pretty severe, like you’re being rolfed. This was pleasant. In addition the package delivers climate controlled seats to the rear passengers and those seats also are power recliners with power lumbar adjustments. Great for a truckload of passengers on a long trip. One final package piece, a cooling box in the front seat console to help keep beverages or food for your cross-country trek properly cooled. Then there are some of the more run-of-the-mill options that most vehicles offer, a lane departure warning system, but with traffic sign recognition, for $640; adaptive cruise control for $1,295, a Meridian premium audio system with 825 watts for $1,650, a park assist warning package for $1,200, a tow pack with all the pre-wiring and an active rear locking differential plus full-size (21-inch) spare tire for $1,300. Things you might live without, but really, you know you want them, a rear entertainment package with screens in the back of the front seat headrests for $2,400 and shadow walnut veneer trim for $1,510. Then there’s a soft door close system for $800. That allows you to sort of latch your door and the ute powers it the rest of the way shut. Ahhh! 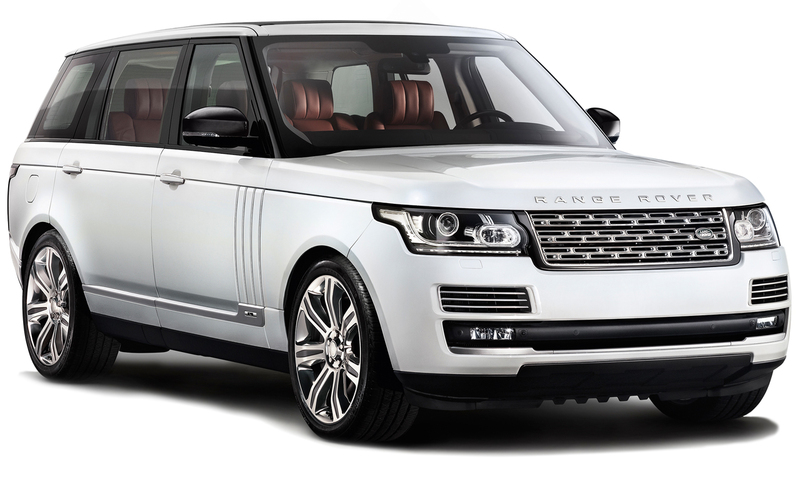 Friends asked WHY the Range Rover was so pricey and I have to admit the price tag shocked me a bit. I expected an $80 grand vehicle. 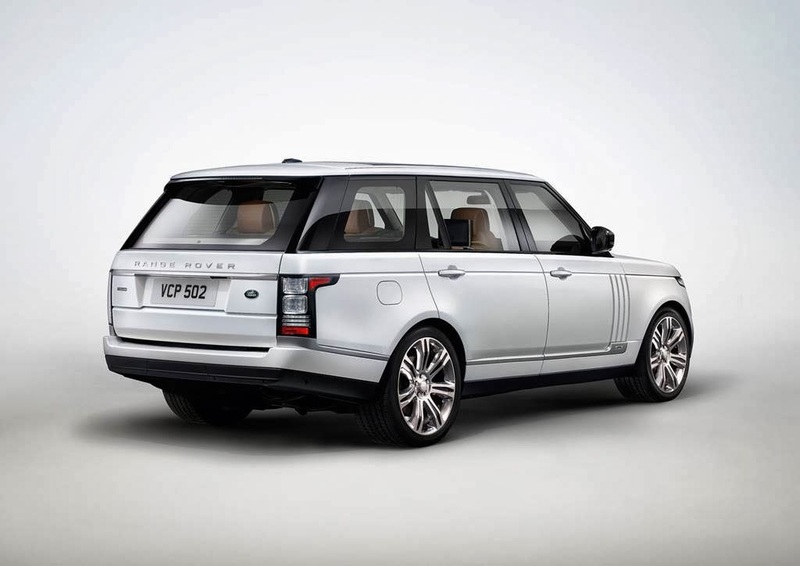 And to be honest, the base Range Rover with supercharged 3.0-liter V6 starts at $84,195, so in the range I was expecting. But in addition to all the add-on goodies listed above, this model has a longer wheelbase. The base model has a 115-inch wheelbase whereas this one is 122.8 inches. Likewise you get more vehicle in that the base is 198.6 inches long and the test ute was 204.7 inches. By comparison, a Chevrolet Yukon is about the same length, but rides on a shorter 116-inch wheelbase, while the Chevy Suburban is 20 inches longer and rides on a longer 130-inch wheelbase. Each has more cargo room than the Rover too. Size matters, but so does horsepower. The base model’s supercharged V6 cranks a reasonable 340 horses, while the supercharged 5.0-liter V8 in the test unit pounds a monster 510 horses with a torque rating of 461. That’s major oomph! 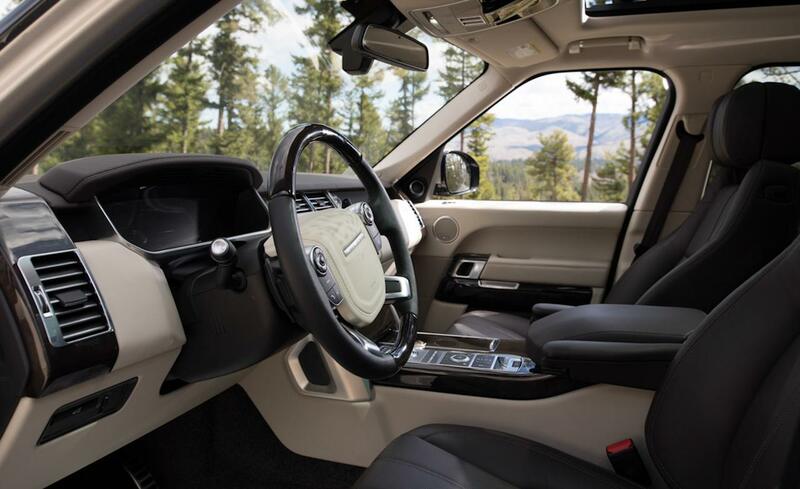 The interior is bathed in soft leathery luxury. Certainly driving it, the Rover feels substantial and well planted, but its handling is surprisingly nimble and easy. I found the Rover easy to park despite its size and the steering feel is moderate. This ute is easy to control in turns. 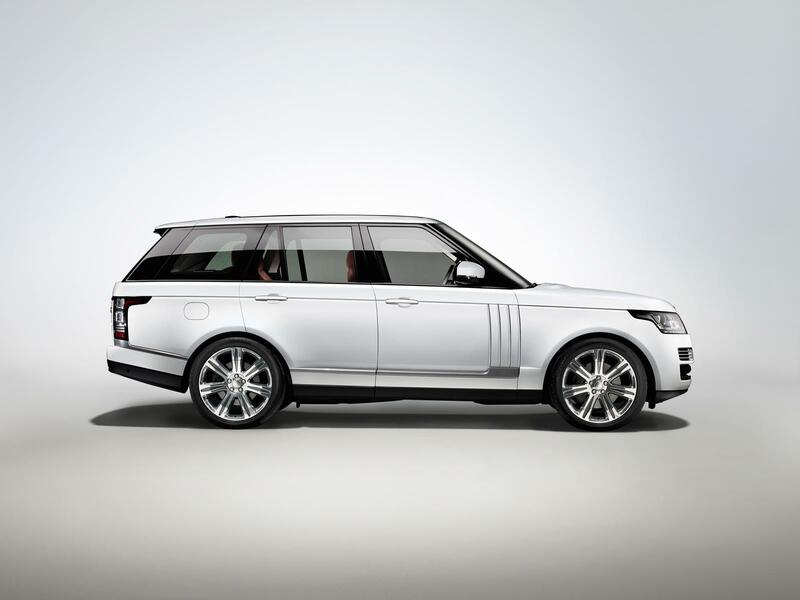 Naturally the LWB Rover is a delightful highway or city cruiser. It’s quiet inside and the ride is as sublime as any import luxury sport sedan. The test truck rides on giant 21-inch R-rated tires, which no doubt plays some roll and would too off-road. Really? Yes, some folks take such pricy utes off road to examine their estates when their horses apparently are in the shop for repairs. You could pull a trailer-load of horses with the supercharged Rover though. It’s rated to pull 7,716 lbs. and its ground clearance is a substantial 8.7 inches. BUT, you can raise or lower the ride height with a button on the center console. Likewise you can dial in at least five terrain preferences to tell the Rover if you’re in mud, sand, snow or crawling up rocks, again with a dial on the console. There’s all-terrain dynamic stability control, four-channel all-terrain ABS, Hill Descent Control to help you creep down steep inclines and independent aluminum suspension at all four wheels. Really, these Rovers will go about anywhere as has been proven to me over the years during off-road excursions at Road America’s infield, usually in muddy conditions. Other safety and performance pluses include four-wheel vented disc brakes, four-wheel electronic traction control, an eight-speed electronically controlled transmission with paddle shifters behind the steering wheel, and oh yes, the monster 510-horse V8. Poke the gas pedal and hang on, you’re headed for a burst of pony power. I was surprised there’s still a wee lag between gas pedal pressure and power, but if you want serious acceleration, it’ll be along shortly. Rear seat folks also have a lot of goodies to improve their ride. The price is gas mileage, but you knew that. I got just 15.2 mpg in a week’s drive, with about 60% being at city speeds. The EPA rates the Rover at 14 mpg city and 19 mpg highway. This prefers higher octane fuel, but will burn E85 as it’s a flex fuel vehicle. If you can afford the Rover, you can afford the gas. Inside, the cream colored leather interior was soft and comfortable. The ride quiet and composed. Pluses, to name a few, include those excellent power seats with three memory settings, a power tilt/telescope steering wheel, a big touchscreen for radio, navigation and a variety of functions. It was fairly easy to sort out, although the buttons on the steering wheel hub that controlled such items as the trip computer were more time consuming and really should only be used while the vehicle is parked. I liked the heated steering wheel and the fact that the wheel was not so thick like many vehicles of late. There’s a giant sunroof and screen overhead, plus dual visors, although neither would slide. The power rear hatch works well and also lowers the lower portion of the tailgate, so loading long items would be easy. There’s excellent cargo space and power buttons inside the hatch to allow a person to lower the rear seats easily to boost storage. Considering at least one Ford truck has running boards that lower when the door is opened, I was shocked that the Rover neither had a permanent running board, or one that lowered automatically. I understand that going off-road you would rather not have a permanent board, but the step-up is sizeable here, so one that lowers for you to board or dismount would make sense. Oddly there also is no third-row seat. There’s plenty of room as there is a load of legroom for the second row seats. So those could be moved forward a bit and a third row added. You’d have to forfeit the giant spare tire though … or put it on the roof or hood, as in vintage Rovers. At this price there’s not much to long for though. The Rover LWB with supercharged V8 is about as good as it gets for power, performance and luxury. I say about, because there’s an Autobiography LWB model, with the same engine, that starts at $185 grand and goes to $199,500 for the top level. So, to put the tested LWB Rover into perspective, it’s a mid-priced model. Misses: A lot of extras needed even with six-digit starting price. No running board or power down step and no third row seat.